Branson, and the surrounding area, is teeming with trails and walking paths of all lengths and surfaces, and trails that meander through a variety of topography. And you won’t have to travel far from your hotel to find excellent walking and hiking opportunities; the City of Branson’s Parks & Recreation Department has excellent trails and walking paths right here in the city limits. Branson RecPlex – 1 mile asphalt path that loops around the entire complex. North Beach – 3/4 mile path located on the banks of Lake Taneycomo and connecting to the Branson Landing Boardwalk. Stockstill Park – 1/2 mile asphalt path that wraps around the playground and ball fields and takes you past Cox Medical Center. From there, you can take a sidewalk to Branson Landing or Historic Downtown Branson. Sunset Park – 6/10 mile paved and lighted path with exercise stations along the way. Lakes Forest Wilderness Area – 4.4 miles of trail that includes areas featuring the city’s most rigorous hiking, including a set of 315 stonework steps constructed in the last 1930’s. You’ll come upon beautiful woodlands, an old homestead and barn, two caves, a grotto, a waterfall, and some of the area’s most stunning views of Lake Taneycomo and the Ozarks’ countryside. Roark Creek – 3.2 miles of trail with all but the last 1/2 mile paved. It ends at a bluff overlooking the creek. There’s also a 1/2 mile ADA accessible trail. Waterfall – 2/3 miles, and the city’s newest trail. Unpaved, it runs along an un-named tributary of Roark Creek. Features include two creek crossings, beautiful rock formations, a waterfall, and a dense tree canopy. 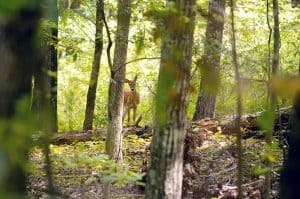 Busiek State Forest – Approximately 18 miles of well-marked trails for use by hikers, bicyclists, and horseback riders. Located just 20 minutes north of Branson. Chinquapin Trail at Table Rock State Park – 1.5 miles of natural surface trail with access to several areas of park services. It shares a section with Table Rock Lakeshore Trail. Drury-Mincy Conservation Area – features 1.5 miles of difficult-level hiking on Bear Creek Trail, and Thurman’s Sink, a .30 mile trail with moderate difficulty. Less than 10 miles from Branson. Hercules Glades Wilderness – 32 miles of maintained trails following open glades, forested ridge tops, and Long Creek. Stunning panoramic views and other scenic features. Ruth & Paul Henning Conservation Area – 3.6 miles with four different hiking experiences: Homesteader’s Trail, a difficult hike of 3.4 miles; Glade Exploration Trail, a moderate hike of 1.1 miles; Shane’s Shortcut, a difficult hike of .30 miles; Dewey Bald Trail, a moderate hike of .40 miles; and Streamside Trail, a moderate hike of .40 miles. White River Valley Trail – 10.25 miles and built on Table Rock State Park and US Army Corps land, land that was used during the construction of Table Rock Dam in the late 1950’s. The trail is sectioned into loops that offer a variety of surfaces and challenges. Branson Creek – several trails of varying lengths are located in the extensive acreage of this gorgeous residential development that’s privately owned; however, the trail system is accessible to the public. You’ll find caves and some fascinating historic sites, like the remains of Melva, a ghost town destroyed by a storm in the early 1900’s. Dogwood Canyon – of varying lengths, trails are found throughout both the groomed and rugged landscapes of this privately owned, but publicly accessible, 10,000 acre property owned by Bass Pro Shops. 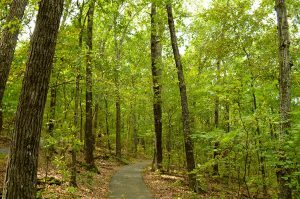 It’s located about 25 minutes from Branson, and unlike most of the hiking trails in the area, admission to the park is required to access the trails. Shepherd of the Hills Fish Hatchery Trails include: The White River Corridor Trail below Table Rock Dam .40 of a mile along the Lake Taneycomo shoreline. It connects to Canebrake Trail, less than a half mile through forested areas, and includes winding wooden bridges. Fisherman’s Trail is only .40 of a mile, and has access to great fishing holes. White River Bluffs Trail is a 1.6 mile loop offering a challenging hike on a dirt/gravel path with some gain in elevation. Table Rock Lakeshore Trail – 2.25 miles along the shore of Table Rock Lake from the State Park to Dewey Short Visitor Center. It’s a paved, relatively flat trail popular with walkers and wheelchair users. A section of the trail is shared with Chinquapin Trail.